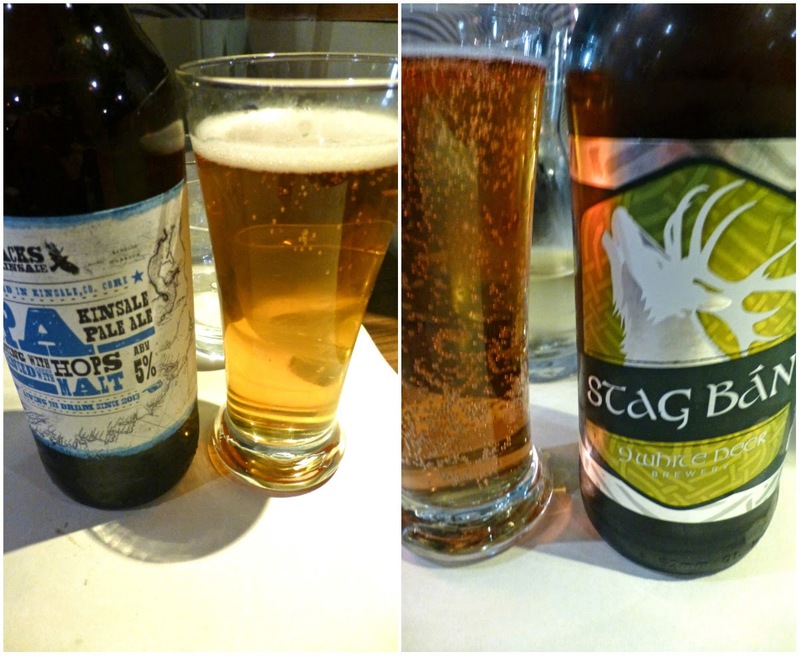 Enjoyed a terrific dinner at the Commons Express Inn at the weekend, the best of local produce washed down with some excellent local beer, including Kinsale Pale Ale by Blacks and the Stag Ban from 9 White Deer in Ballyvourney. Great buzz there too as we were guided to our table in the very comfortable dedicated dining area. Had a look at the specials on the blackboard - you'll also see them on an insert in the main menu. 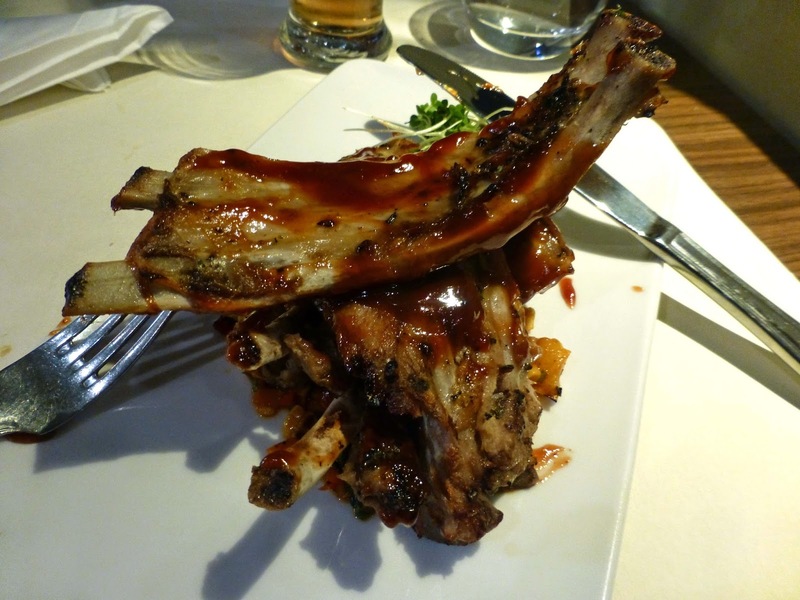 The new chef here is from Canada so we decided to try out a couple of his specialities and I was soon tucking into the BBQ Slow-roasted Baby Back ribs with Bourbon sauce. Despite the messy fingers, I certainly enjoyed those “melt-in-your-mouth tender morsels of pork”, enhanced by that special sauce and also by the sweetcorn salsa. It was a little less messy (just a little!) 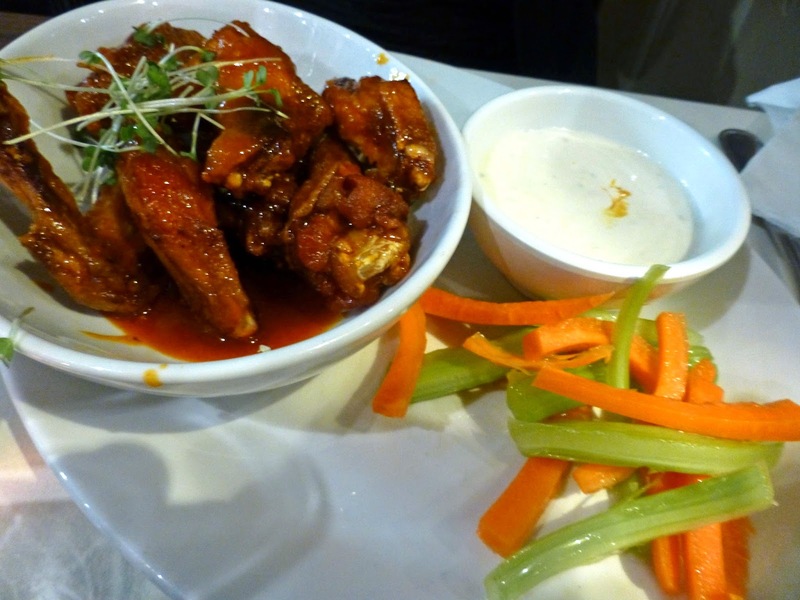 at the other side of the table where a quiet CL was enjoying her Spicy Buffalo Wings, “exactly like the Frank and Mary’s originals from Niagara Falls N.Y. right down to the special cheese dip and the carrot and celery sticks”. Brilliant starters then and the mains were on a par. I had been looking forward to the char-grilled lamb but that had run out so I picked the 8 oz fillet instead. 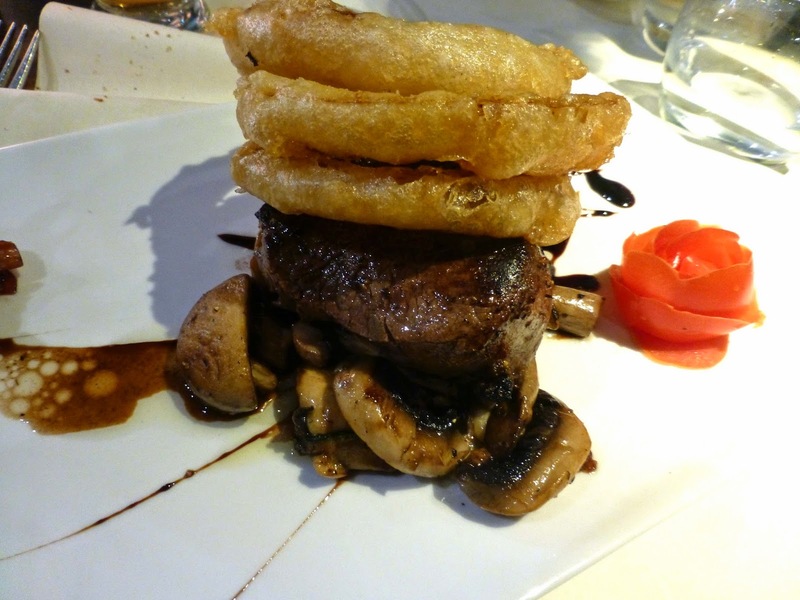 All their steaks are aged to 35 days and this was char-grilled to perfection. I had requested Medium and that is what I got along with crispy onion rings, sautéed mushrooms and, on the side, there were fresh cut chips and a crispy salad. 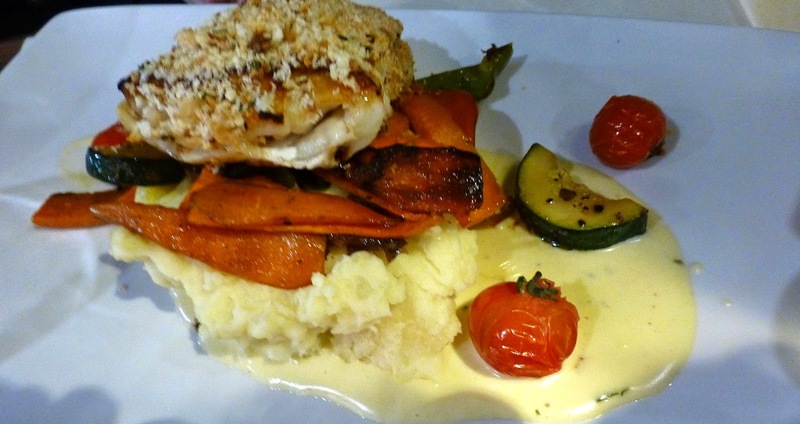 CL had picked one of the specials: Pan-fried Cod Fillet with a herb crust and roasted vegetables and, on the side, she had mashed potatoes and vegetable selection, all very good and all for €15.95! 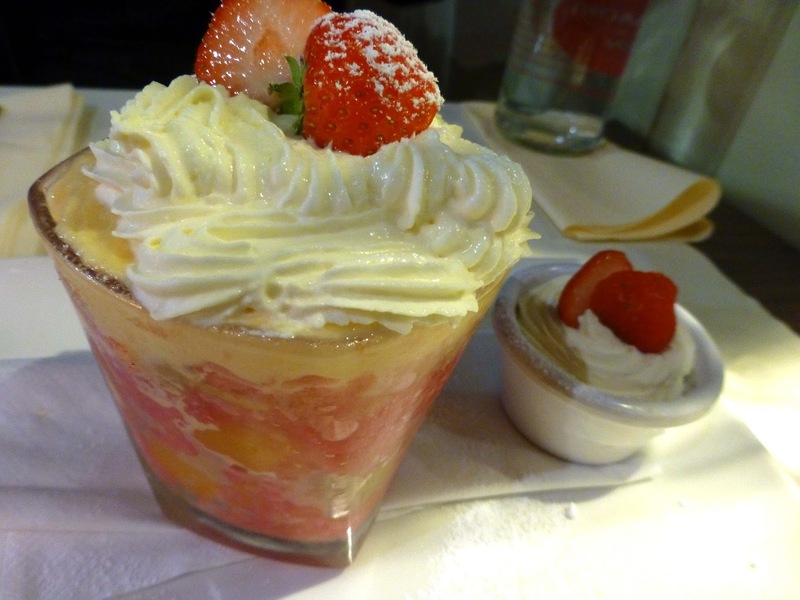 There was a bit of a debate about dessert before the decision to share their splendid Sherry Trifle and soon two happy customers were walking out into the misty evening, well fed and heading for the fire at home. They start early at the Commons Express Inn. 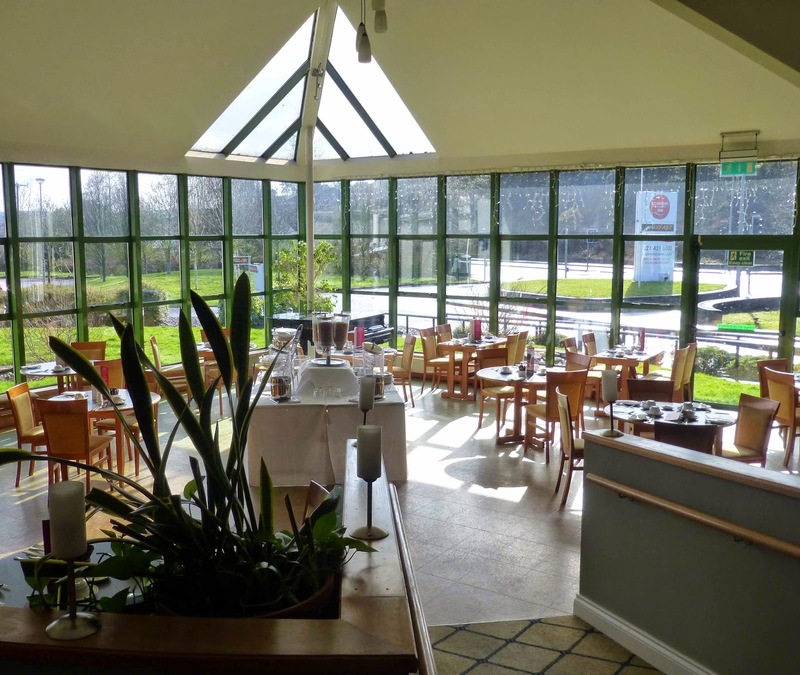 Residents can have breakfast in the lovely Bailey Restaurant from 7.30am until 10.00am. But don’t worry if you sleep late. 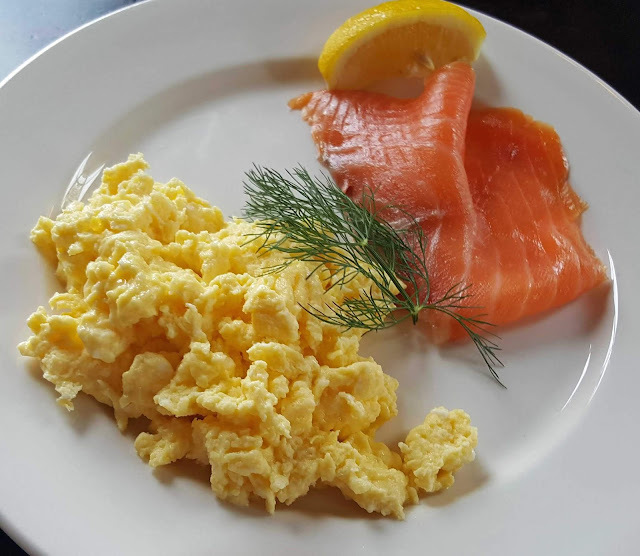 In a new departure, breakfast is now being served in the bar from 10.00 until noon and is open to residents and walk-ins alike. The big bar has been the beating heart of the Commons for close on thirty years now but, under new chef Arthur Van Leeuwen, the food offering is becoming more and more important. Indeed, Arthur and his team will feed you all day long. As soon as breakfast is over in the bar, the carvery lunch kicks in, as it has for the past 27 years! It is a very popular lunch with many customers coming from the nearby business parks. And you won't get bored with the menu; it has its regular favourites of course but do watch out for the variations, including tasty items not often seen in a carvery, such as ham hock, beef stroganoff, and braised lamb shoulder chops. Later, the evening menu draws the customers to the dedicated dining area in the spacious lounge. Jason Sleator, Sales and Marketing Manager, tells me the menu is evolving under Arthur who describes himself as “a Canadian backyard boy”. The chef uses local meats and is “very fussy on quality”. Using his experience, he often chooses the cheaper cuts, briskets and ribs for example, and loves marinating them and especially char-grilling. And the dishes, including Spicy Buffalo Wings (exactly like Frank and Mary’s from Niagara, New York) and Back Ribs with Bourbon Sauce, Char-grilled Rack of Lamb, and Char-grilled Burgers, are increasingly popular. “We are still on a journey,” Jason told me as regards the regular menu and hints of where they are going can be gleaned from the weekly specials. One of this week’s mains sees Chicken Supreme served with chunky butternut squash and a Cajun jus, the jus a contribution from Arthur’s repertoire. The Commons, now part of the Great National group, are lucky in the continuity of management and staff. Myles O’Neill is the General Manager while brother Greg is Food and Beverage Manager. That have been there since day one and quite a few of the staff also have impressive long serving records, all of which helps the Commons run smoothly. They have many functions here, social and sporting celebrations, and all kind of family occasions. Many of these are held in the Bailey while the Roebuck Suite is an impressive ballroom style hall for the really big occasion, including weddings, although there is also a trend currently towards restaurant weddings. The Bailey too, by the way, comes into its own as an impressive Sunday lunch venue and is much demand for private dining. Taking a look at Cork City cuisine! Clonakilty Chocolate. From Ghana to Clon. Farm Restaurant, Clonakilty. Well Worth A Visit. Your Weekend Whites. Trio with Brio! Top Posts for last 18 months.